ILOILO SOUND CAPITAL OF THE PHILIPPINES! 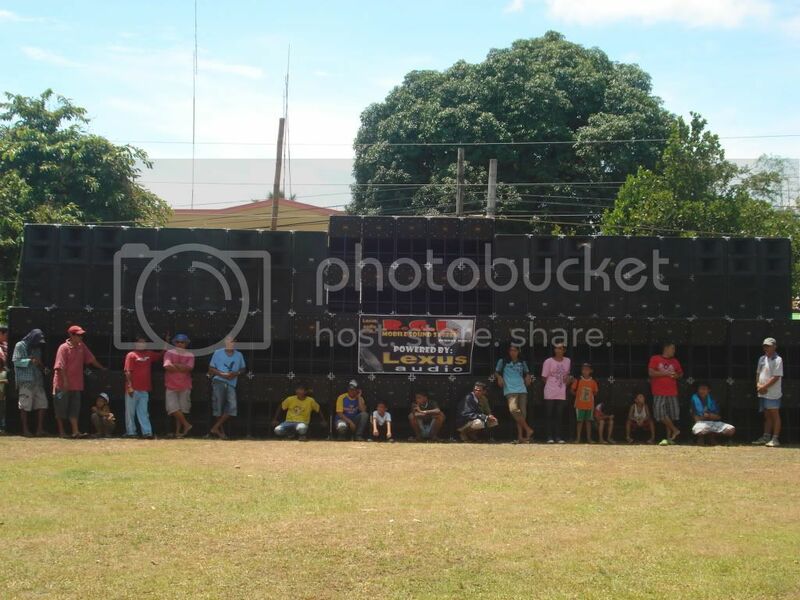 Re: ILOILO SOUND CAPITAL OF THE PHILIPPINES! 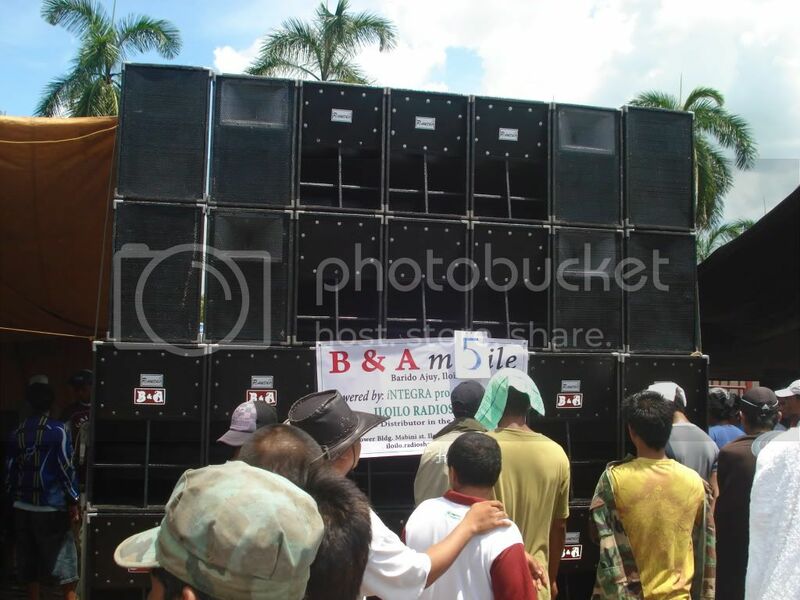 150 feet long, 35 feet tall, 550,000 watts program (very conservative), 460 channels of QSC and BSS amplification, all Turbosound cabs ofc - 300 TMS-3s and 60 TSW-124s. 4 way setup using ONE cross-over modified for the load & current draw required. 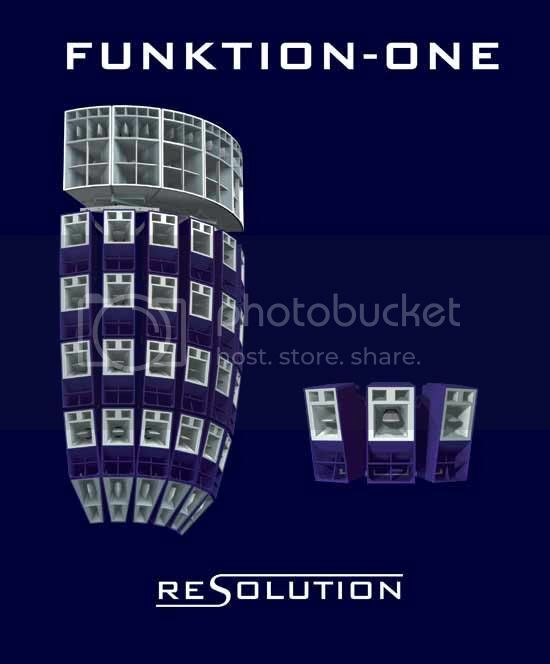 i think the price of the funktion-one resolution5 series is php 350,000 per cab. just a passive set-up. 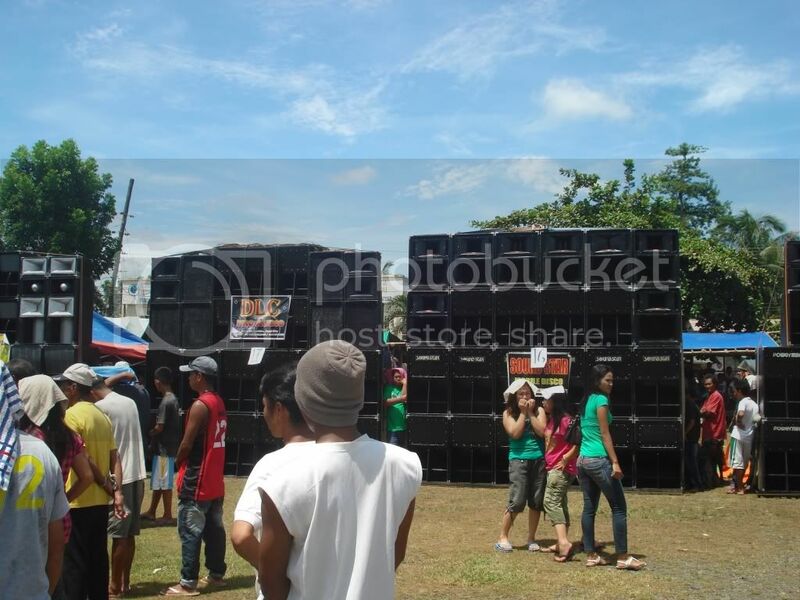 it is locally distributed by stagecraft trading and most outdoor shows of gma 7's s.o.p. and now party pilipinas use this. Yes sa Stagecraft ang Funktion-One at Turbosounds. Contact person is Eric Deogracias. wow saan sa iloilo city ang battle nito sir? heard na nagpa battle si RGL last sunday. ito ba yun? "The wrong piece of gear, at the right price, is STILL the wrong piece of gear". Just a question mga sirs. What is the objective of a "Battle" ? Salamat. 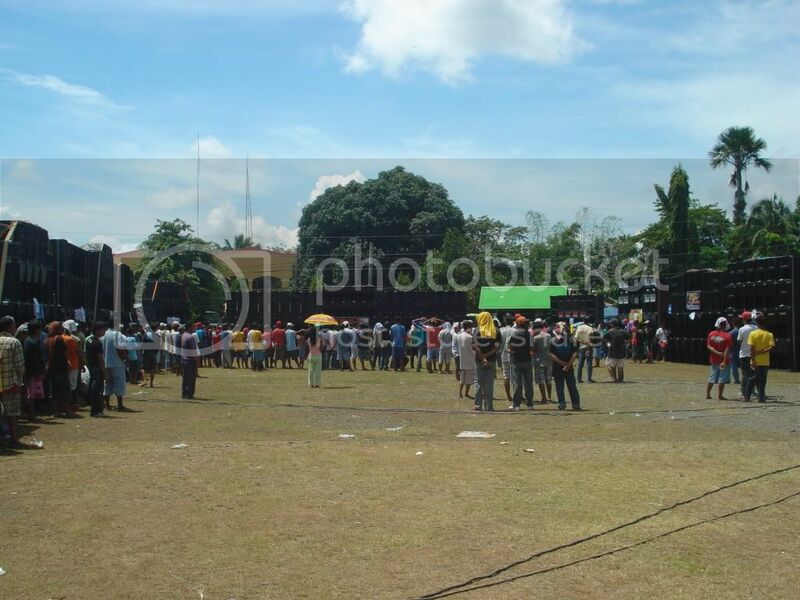 Let me tell you sumtin from the past....why ilonggos are music lover!!! at mahilig sa bayli/sayawan!! The Dinagyang is a religious and cultural festival in Iloilo City, Philippines held on the fourth Sunday of January, or right after the Sinulog In Cebu and the Ati-Atihan in Aklan. It is held both to honor the Santo Niño and to celebrate the arrival on Panay of Malay settlers and the subsequent selling of the island to them by the Atis. 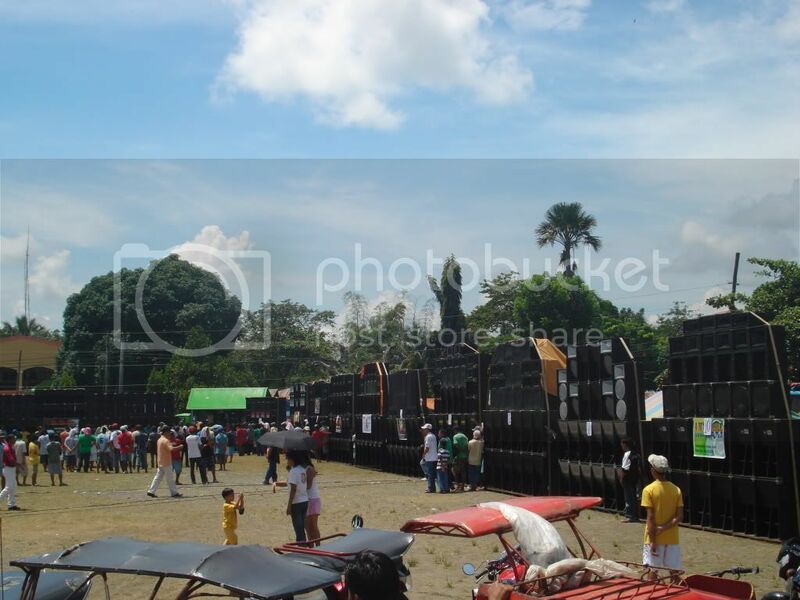 In the beginning, The Confradia patterned the celebration on the Ati-atihan of Ibajay, Aklan, where natives dance in the streets, their bodies covered with soot and ashes, to simulate the Atis dancing to celebrate the sale of Panay. It was these tribal groups who were the prototype of the present festival. The Dinagyang is divided into three Major events: Ati-Ati Street Dancing, Kasadyahan Street Dancing and Miss Dinagyang. Today, the main part of the festival consists of a number of "tribes", called "tribus", who are supposed to be Ati tribe members dancing in celebration. and so on naging modern na ung street dancing ginamitan na ng makabagong teknolohiya at nauso na ung laban ng sound....at di lang sa iloilo, buong Island ng Panay - Capiz, Antique, Aklan, Bacolod at guimaras ay maraming mga sound set ups din..
"@uncajesse Where making history here idiot... can you name somewhere in the world where﻿ events like this happens. 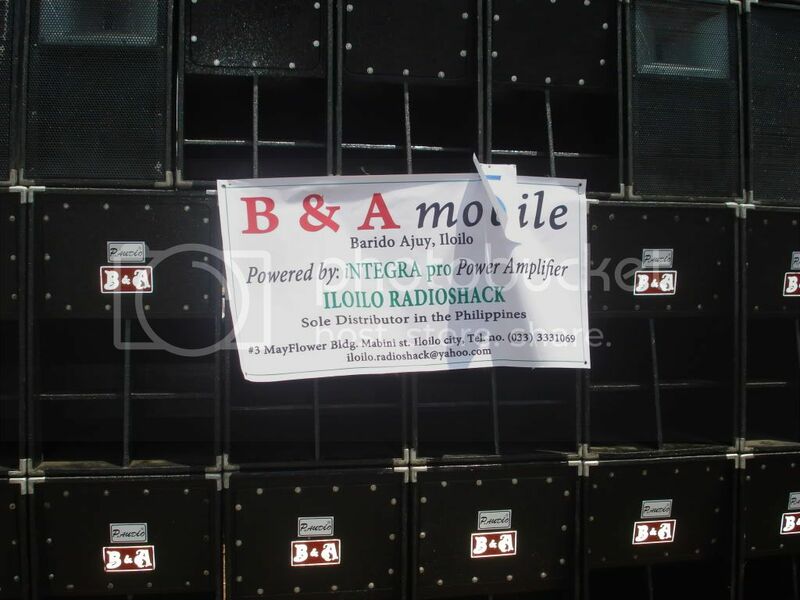 where more audio equipments are display!!!! You can name some but for sure is a lower version of ours here!!! You will be the one listed in the "hall of shame" not us.. becuase your an idiot !!!" We are not alone...and We are not the first...We just borrowed the technology for us to enjoy it and have fun. And the winner is... ?? kumustan naman feedback sa integra pro sir? mas malakas ba sa CA25 ng Crell? sir, who's the guy reclining at the floor (last frame)? Hindi ko alam Sir, excerpt lang from internet while browsing...natuwa kasi ako, kasi masaya sila kahit na mahirap at mabibigat ang trabaho nila. i thought that was you, sir. anyway, nice gear nila. impressive din mga shares mo dito, sir, nice drawings. yours? wonder what software your using? thanks uli, sir. Hindi para sa akin ang credit na yan Sir...pero maraming salamat na rin. hayaan mo sa susunod na mga drawing lagyan natin ng signature ni JuanDelaCruz. Tulad ng Dispersion angle: If we ground stack them ano ang degree ng comb filtering and Lobing? If we ground stack them in multiple point source what will be the group delay? Plenty of air is being moved, but it was moving in too many directions. Sound is arriving at the listener’s location at too many different times because the pressure waves from multiple speaker sources overlapped. A practical example is analogous to throwing a stone into a pond. Even waves spread out in all directions, their energy dissipated uniformly. If they hit any object or barrier, waves are reflected back into the on coming waves causing little wavelets to disturb the even spread of waves. If you throw a handful of gravel instead of a small stone, there will be a disturbed wave flow right from the first splash. Imagine one speaker source as the small stone and an array of speakers as the hand full of gravel. In the frequency domain, this uneven confusion of waves is called Lobing and Comb Filtering: it results in inconsistent frequency response across the coverage area. In the time domain it’s called multiple arrivals. The human ear is quite sensitive to multiple arrivals, especially in the horizontal plane, since that’s how we locate the source of sound. The human ear is perfectly designed to hear speech and detect the direction of a sound source due to its stereophonic nature. A sound that arrives at both ears at exactly the same time (remembering 1,100 ft per second) is right in front of you. Sound to one side will arrive at one ear slightly later than it arrives at the closest ear. This fractional time delay between arrival times is how we perceive direction. The ‘phase shift’ (time shift), caused by the differing time arrival changes the sound a little. Small cancellations take place and on a frequency graph you would see a series of deep narrow dips. This is called Comb Filtering. 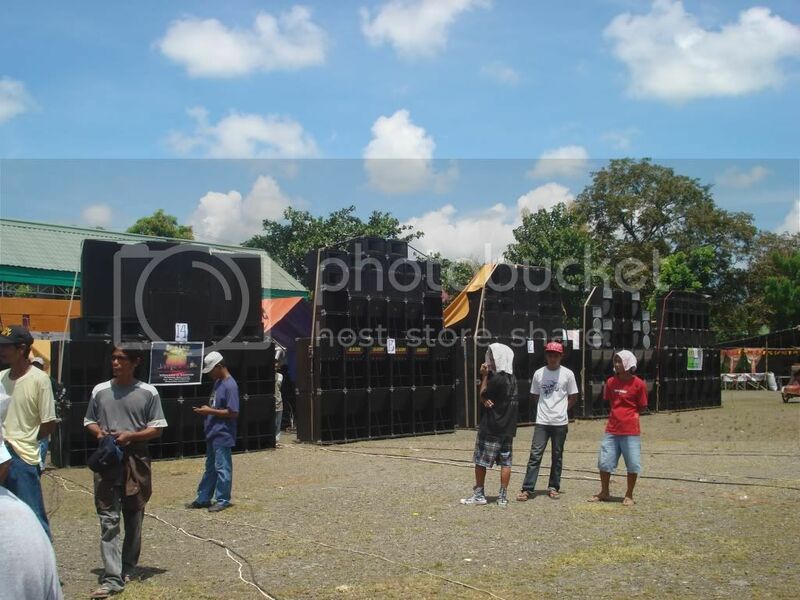 Our first concert situation is an array of two full range boxes each side of the stage at an outdoor festival. It sounds like a simple situation. We can see now that any single loudspeaker may have an even frequency response, and the sound quality of a single loudspeaker may be nothing short of hi-fidelity, but that will not be the case once arrayed. With these direct-radiator packaged speaker systems grouped in a cluster, the individual drivers cannot be positioned to minimize time delays between devices and the resulting destructive interference, cancellation and response variations. (Comb filtering). These variations are important because the coverage uniformity in the 1,000Hz to 4,000Hz range is critical for good intelligibility and uniform frequency response from 250Hz to 1,000Hz is important for natural sounding speech or music. The empirical rule use to be, put up one box or 100 and anything between was trouble. This was found by practical experience that if you put up enough boxes, all the aberrations seemed to even out if you stood far enough away. (Too bad for the people who paid to hear and have the ‘dud’ seats. There will be plenty of them). So let’s add more boxes to our two-box array? May be that will help. We have gone from throwing four pebbles into the pond, (two per hand full), to eight. Let’s see what happens. In the four-box cluster of unspecified Brand-X 2-way full-range boxes, there is approximately 1 meter between the box centers, both horizontally and vertically. (That's a half wavelength at 225Hz, one wavelength at 450Hz, and two wavelengths at 900Hz). 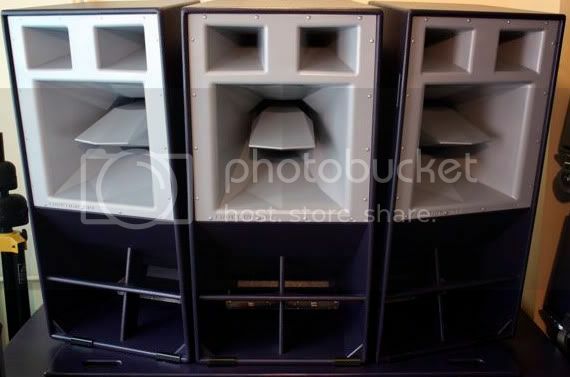 At the crossover point, where the horn and the 12" bass speaker in each box are operating at equal levels, there are a total of eight devices operating at the same level with multiple wavelength spacing between all eight sound sources. This is the offset distance vertically, horizontally and diagonally between all devices. Where the coverage of the boxes overlap, there will be significant lobing of the coverage and comb filtering caused by these physical-offset-induced signal delays. The problem is compounded by the inability of the small format high frequency horns that are used in these boxes to provide high directivity, (narrow focus), in the vertical plane above the crossover frequency. The actual vertical coverage of the horn can be well over 100 degrees (and can approach 180 degrees) at the crossover point, ensuring vertical overlap of coverage between boxes, and destructive interference and cancellation. Above the crossover point, the comb filtering will fall in the critical speech intelligibility range, and the resulting response notches are often in excess of 1/3 octave wide. Below the crossover point, the 12" bass drivers gradually broaden their coverage angle until the boxes each become almost omni-directional. In the frequency range between 250Hz and 1000Hz, very large variations in level will be found, with the highest uniform level exactly on the centre axis of the cluster, and spurious lobes all around that centre hot spot. This produces plainly audible sound quality variations with seating position, and may produce feedback prone positions under the cluster. Wave C is now cutting across wave D out of time sync. The slight time variation (60 degrees) will mean that there is a pressure lag between the waves and they will be working against each other. It’s like a tug of war with everybody pulling at a slightly different time. What about the fancy system controller? So why don't you just equalize it? Consider the system equalizer that is intended to improve the quality of the sound. All four loudspeakers are connected to the same signal chain, so any change in equalization will affect all four speakers. Which of these frequency response curves would you correct for? A couple of the seats are not too bad, a couple of them (including the house mix position!) are very poor. If you tried to correct the bumps and dips in one location, you would actually be making them worse in other areas. This is really a non-equalizable problem caused by physical distance offset of all the drivers (this is what is known as a non-minimum phase problem caused by a significant signal delay). Even though the loudspeakers are designed to be arrayed horizontally, there is no way to get around the physical offset problem vertically with small packaged two way direct-radiator systems. There are no delays or equalizers that will fix this problem (until someone develops a four dimensional signal processor). What if We Try a Different Type of Horizontal Array? In this particular configuration, the comb filters and peaks are most severe below the crossover point, where there are three 12" loudspeakers and horns widely arrayed. The 12" speakers cannot be positioned to minimize the interference between them because the boxes are pre-configured with a horn and top end with differing dispersion. By the time you get the high-frequency horns pointed where they have to be pointed, the woofers are typically in the worst possible relationship to each other. The laws of physics and inappropriate box selection triumph every time. In fact in this particular instance, the only available correction would be turning off two of the centre box. This would of course result in a sonic hole between the boxes but the Lobing would be much less. The reason for the extra boxes was not enough SPL to cover the distance. With all the losses and cancellations, severe EQ and headroom loss, we really have not progressed from the smaller array as far as sonic performance is concerned. Remember the dB scale and the human ear? For a slight increase in perceived volume, we must add 3dB, (double the power). So we need a lot more boxes to make a difference. Don't get fooled, by ‘everybody knows’ generalisations and simplistic solutions. Just because something appears to be popular, does not mean that it is good. Many of these small rock and roll speaker rigs sound very impressive, when demonstrated with a CD of pre-recorded music. Most listeners are much more forgiving of response variations when listening to music. If you're listening to a system intended for speech or complex music reinforcement, insist that it be demonstrated with a live microphone in the room at real world volume levels. Is there reasonable gain before feedback? If the speaker system is hung above the microphone, are there bass lobes aimed at the microphone position that will induce feedback? Above all else, is the voice going to make it to the back of a crowded noisy room? Some compact boxes may sound a bit ‘in your face’ when tested in a shop or small room. This could be because the mid range is very present. Many self-powered speaker systems have been pre-equalized to sound ‘nice’ but you will need those midrange frequencies back again if you want to project clear vocals to the back of the room. For a speaker box designer, those midrange frequencies are the hardest thing to get right because the crossover into the horn is often right in the middle of the midrange. Getting vocals right is the hardest thing because it is the only thing everybody agrees must be there and is use to hearing. This especially applies when you're buying a speech reinforcement system, listen for how well it delivers the speech intelligibility your audience needs and don't get fooled by marketing and technical hype. Set up a two-channel array together with a digital delay on one channel. Show with pink noise sonic variations with a few milliseconds variations between boxes. Also dB output variations on one box and array behaviour. Hear polarity reversal on one channel electronically and acoustically. Especially try reversing the phase on one element of top end. The image will shift radically. Remember this sound and you will become the worlds best monitor engineer by spotting out of phase wedges instantly. Put up a poorly aligned array and test with pink noise. Move the boxes into a theoretically less conflicting alignment. Walk around and look for lobes and null points.